It has been roughly 3 months since the Apple Watch hit the market and, as we expected, we have received no hard sales figures from Apple. However, there have been multiple reports from third party analysts and analytics firms that give us some sparse data about its progress. Joining these disparate pieces of data may give us some insight into the current state of Apple Watch demand. Third-party estimates and data can be tricky to analyze as samples and methodologies aren't always scientific. A standalone, third-party estimate can certainly be inaccurate. However, if multiple third-party data sources (with entirely different methodologies) point to the same trend, they are probably very close to reality. Let's begin with the usual suspects: Wall-Street Analysts. Many analyst firms, including KGI Securities, BMO Capital Markets, UBS and Pacific Crest have already slashed Watch estimates, some quoting "supply chain sources". However, Global Equities and Morgan Stanley have remained bullish quoting their own surveys and "checks". All in all, the "nays" seem to have it, but this doesn't seem very conclusive. Up next, analytics firms. Slice Intelligence's well publicized estimates haven't painted Apple Watch demand in a positive light. 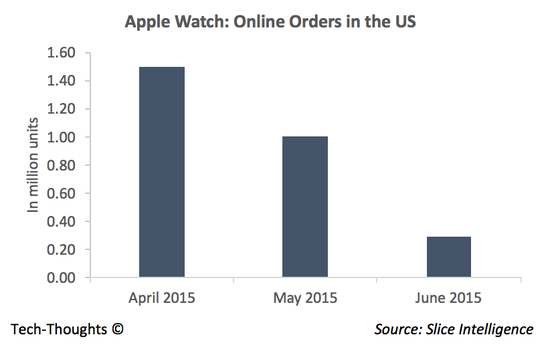 According to Slice's monthly updates, Apple Watch orders have declined from nearly 1.5 million in April to less than 300,000 in June. Of course, these estimates are based on email receipts and only track online orders in the US so this isn't a complete picture. Another analytics firm, Argus Insights, tracked social media interest in various wearable products leading up to the Apple Watch launch. Interestingly, social media interest in the Apple Watch appeared to match those of other wearables, none of which have been wildly popular. Finally, we have Google Trends. My previous analysis showed that interest in the Apple Watch at launch was far lower than that seen by the original iPhone and iPad in 2007 and 2010 respectively. 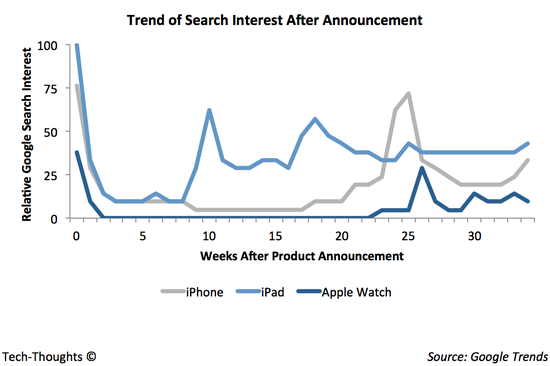 But where does search interest in the Apple Watch stand today? 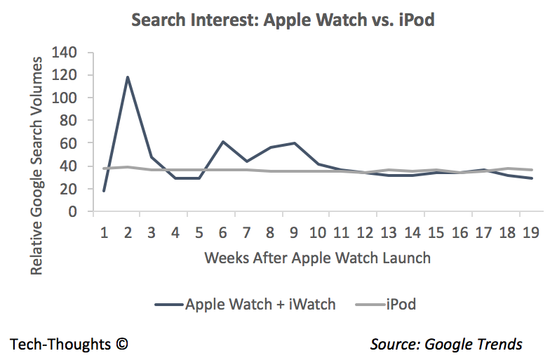 As some wall street analysts have pointed out, interest in the Apple Watch currently trails the iPod. In fact, not only does it trail a product that is already mature, but the gap between them also seems to be increasing. Also, the Apple Watch became available for retail purchase in week 16 in the chart above. However, it appeared to have no impact on search interest. Are there any other "comparable" products we can look at? 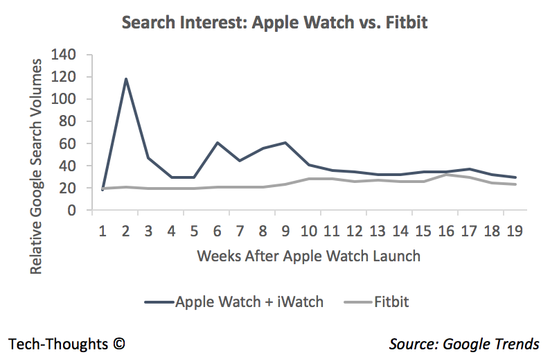 Search interest in the Apple Watch appears hold a slim lead over the Fitbit. This also seems to back up the data from Argus Insights. All of these disparate sources point to the same trend: the Apple Watch has been less than a hit with consumers. I have heard suggestions that this is just another consumer cycle, but that narrative doesn't quite fit with sales data of the original iPhone and iPad. Each of those devices launched in the first half of the calendar year and saw sequential growth for three straight quarters before a seasonal decline in the following Q1. This was a result of strong word-of-mouth from early adopters and influencers. The data points in this post suggest that this feat will be very difficult for the Apple Watch to achieve. At launch, it certainly seemed like there was pent-up demand for a new Apple product. However, the data points in this post suggest that there still isn't much of a market for the Apple Watch or other smartwatches. Some have suggested that the early unveiling and lack of early retail availability dampened excitement. Another possibility is that underwhelming demand for the Apple Watch and other wearables are related, in that mass market use cases for these devices remain elusive.